United Nations Peacekeeping began in 1948 when the Security Council authorized the deployment of UN military observers to the Middle East. The mission's role was to monitor the Armistice Agreement between Israel and its Arab neighbours – an operation which became known as the United Nations Truce Supervision Organization (UNTSO). Since then, more than 70 peacekeeping operations have been deployed by the UN. Over the years, hundreds of thousands of military personnel, as well as tens of thousands of UN police and other civilians from more than 120 countries have participated in UN peacekeeping operations. More than 3,000 UN peacekeepers from some 120 countries have died while serving under the UN flag. UN Peacekeeping was born at a time when Cold War rivalries frequently paralyzed the Security Council. Peacekeeping was primarily limited to maintaining ceasefires and stabilizing situations on the ground, providing crucial support for political efforts to resolve conflict by peaceful means. Those missions consisted of unarmed military observers and lightly armed troops with primarily monitoring, reporting and confidence-building roles. The first two peacekeeping operations deployed by the UN were the UN Truce Supervision Organization (UNTSO) and the UN Military Observer Group in India and Pakistan (UNMOGIP). Both of these missions, which continue operating to this day, exemplified the observation and monitoring type of operation and had authorized strengths in the low hundreds. The UN military observers were unarmed. 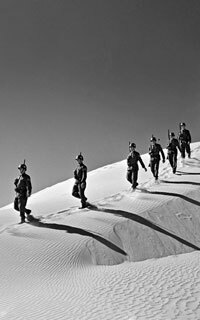 The earliest armed peacekeeping operation was the First UN Emergency Force (UNEF I) deployed successfully in 1956 to address the Suez Crisis. The UN Operation in the Congo (ONUC), launched in 1960, was the first large-scale mission having nearly 20,000 military personnel at its peak. ONUC demonstrated the risks involved in trying to bring stability to war-torn regions - 250 UN personnel died while serving on that mission, including the Secretary-General Dag Hammarskjold. In the 1960s and 1970s, the UN established short-term missions in the Dominican Republic - Mission of the Representative of the Secretary-General in the Dominican Republic (DOMREP), West New Guinea (West Irian) - UN Security Force in West New Guinea( UNSF), and Yemen - UN Yemen Observation Mission (UNYOM), and started longer term deployments in Cyprus - UN Peacekeeping Force in Cyprus (UNFICYP) and the Middle East - UN Emergency Force II (UNEF II), UN Disengagement Observer Force (UNDOF) and UN Interim Force in Lebanon (UNIFIL). In 1988, UN peacekeepers were awarded the Nobel Peace Prize. At that time, the Nobel Committee cited “the Peacekeeping Forces through their efforts have made important contributions towards the realization of one of the fundamental tenets of the United Nations. Thus, the world organization has come to play a more central part in world affairs and has been invested with increasing trust”. With the end of the Cold War, the strategic context for UN Peacekeeping changed dramatically. The UN shifted and expanded its field operations from “traditional” missions involving generally observational tasks performed by military personnel to complex “multidimensional” enterprises. These multidimensional missions were designed to ensure the implementation of comprehensive peace agreements and assist in laying the foundations for sustainable peace. The nature of conflicts also changed over the years. UN Peacekeeping, originally developed as a means of dealing with inter-State conflict, was increasingly being applied to intra-State conflicts and civil wars. UN Peacekeepers were now increasingly asked to undertake a wide variety of complex tasks, from helping to build sustainable institutions of governance, to human rights monitoring, to security sector reform, to the disarmament, demobilization and reintegration of former combatants. After the Cold War ended, there was a rapid increase in the number of peacekeeping operations. With a new consensus and a common sense of purpose, the Security Council authorized a total of 20 new operations between 1989 and 1994, raising the number of peacekeepers from 11,000 to 75,000. Elect new governments and build democratic institutions. The general success of earlier missions raised expectations for UN Peacekeeping beyond its capacity to deliver. This was especially true in the mid 1990’s in situations when the Security Council was not able to authorize sufficiently robust mandates or provide adequate resources. Missions were established in situations where the guns had not yet fallen silent, in areas such as the former Yugoslavia - UN Protection Force (UNPROFOR), Rwanda - UN Assistance Mission for Rwanda (UNAMIR) and Somalia - UN Operation in Somalia II (UNOSOM II), where there was no peace to keep. The setbacks of the early and mid-1990s led the Security Council to limit the number of new peacekeeping missions and begin a process of self-reflection to prevent such failures from happening again. The Secretary-General commissioned an independent inquiry [S/1999/1257] into the actions of the United Nations during the 1994 genocide in Rwanda and, at the request of the General Assembly, provided a comprehensive assessment [A/54/549] on the 1993-1995 events in Srebrenica in the former Yugoslavia. The circumstances that led to the UN withdrawal from Somalia were also carefully examined [S/1995/231]. 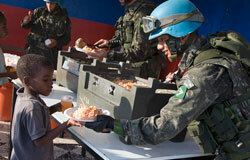 In the meantime, UN peacekeepers continued their long-term operations in the Middle East, Asia and Cyprus. Haiti - UN Support Mission in Haiti (UNSMIH) UN Transition Mission in Haiti (UNTMIH) and UN Civilian Police Mission in Haiti (MIPONUH). At the turn of the century, the UN undertook a major exercise to examine the challenges to peacekeeping in the 1990s and introducing reform. The aim was to strengthen our capacity to effectively manage and sustain field operations. With a greater understanding of the limits – and potential – of UN Peacekeeping, the UN was asked to perform even more complex tasks. This started in 1999 when the UN served as the administrator of both Kosovo in the former Yugoslavia - UN Interim Administration Mission in Kosovo (UNMIK), and in East Timor (now Timor-Leste) - UN Transitional Administration in East Timor (UNTAET), which was in the process of gaining independence from Indonesia. Syria - UN Supervision Mission in Syria (UNSMIS). Peacekeepers also returned to resume vital peacekeeping and peacebuilding operations where fragile peace had frayed, in Haiti -UN Stabilization Mission in Haiti (MINUSTAH) and the newly independent Timor-Leste - UN Integrated Mission in Timor-Leste (UNMIT). Many of these operations have now completed their mandates, including the UN Mission in the Central African Republic and Chad (MINURCAT), UN Organization Mission in the Democratic Republic of the Congo (MONUC), UN Operation in Burundi (ONUB), UN Mission in Sierra Leone (UNAMSIL) and UN Mission in Ethiopia and Eritrea (UNMEE) and UN Mission in the Sudan (UNMIS) and UN Operation in Côte d'Ivoire (UNOCI). In the first decade of the century, UN Peacekeeping found itself stretched like never before and increasingly called upon to deploy to remote, uncertain operating environments and into volatile political contexts. Peacekeeping faced a varied set of challenges, including challenges to deliver on its largest, most expensive and increasingly complex missions, challenges to design and execute viable transition strategies for missions where a degree of stability has been attained, and challenges to prepare for an uncertain future and set of requirements. By May 2010, UN Peacekeeping had entered a phase of consolidation. 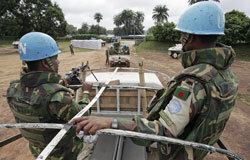 The numbers had, for the first time in a decade, begun to decline slightly, with the reduction of troops in UN Organization Stabilization Mission in the Democratic Republic of the Congo (MONUSCO) and the withdrawal of UN Mission in the Central African Republic and Chad (MINURCAT) at the end of 2010. Today, a little more than 110,000 military, police and civilian staff currently serve in 14 peacekeeping missions, representing a decrease in both personnel and peacekeeping missions, as a result of peaceful transitions and the rebuilding of functioning states. However, the reduction in personnel and peacekeeping missions in the intervening years by no means indicates that the challenges faced by the UN are diminishing. The emergence of new conflicts spreading beyond local and regional boundaries signal that the demand for field missions is expected to remain high and peacekeeping will continue to be one of the UN’s most complex operational tasks. Moreover, the political complexity facing peacekeeping operations and the scope of their mandates, including on the civilian side, remain very broad. There are strong indications that certain specialized capabilities – including police – will be in especially high demand over the coming years. Today's multidimensional peacekeeping will continue to facilitate the political process, protect civilians, assist in the disarmament, demobilization and reintegration of former combatants; support the organization of elections, protect and promote human rights and assist in restoring the rule of law. Peacekeeping has always been highly dynamic and has evolved in the face of new challenges. In October 2014, the UN Secretary-General established a 17-member High-level Independent Panel on UN Peace Operations to make a comprehensive assessment of the state of UN peace operations and the emerging needs of the future. The HIPPO report, as it is known, was issued in June 2015, with key recommendations for the way forward for peace operations. In September 2015, the Secretary-General’s issued his own report on the implementation of these recommendations and the future of peace operations. For further overview of our ongoing operations, the current strategic context and priorities as well as the evolving challenges facing the peacekeeping today, please review the 20 October 2016 statements to the General Assembly's Fourth Committee by the former Under-Secretary-General for Peacekeeping Operations, Hervé Ladsous and the Under-Secretary-General for Field Operations, Atul Khare.